Pick a nice day, and get to Terminal del Norte (the Northern Bus Terminal) by taking the Metro to Estación Caribe (Caribe station). Sotrasanvicente bus company has regular services to Piedra del Peñol. The 1 hour 45 minute trip costs 9,400 Colombian pesos (or USD 5.30). From where you get off the bus, it’s an easy walk up the hill to the carpark at the foot of Piedra del Peñol. Don’t get suckered into hiring a donkey. Piedra del Peñol reminded me of Uluru (also known as Ayers Rock) in Australia. Both are massive sentry rocks that stand out from miles away. You will get the first beautiful view of the lake from the carpark. But the real fun begins when you start climbing up the dodgy looking stairs wedged in between the narrow vertical crack that runs all the way up to the top of Piedra del Peñol. You will see a coat of plants growing precariously on the vertical rock face as you climb the 649 steps. 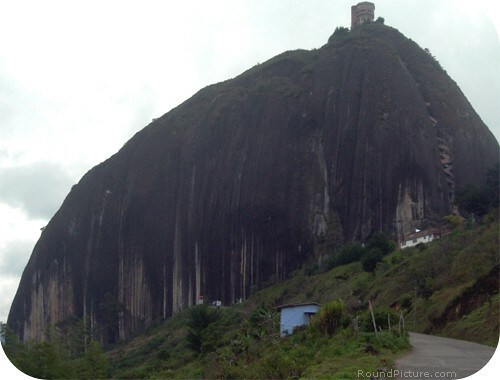 Piedra del Peñol apparently belongs to a family from the region, and there is a charge of around USD 2 to climb it. Once you make it to the top, you can climb to the roof of the 3 story gift shop for the incredible 360° view. You will be delighted by the panorama of numerous islands spread out in front of you as far as your eyes can see, and the sprawling arms of the lake that fill the small bays of what used to be hillsides. That’s right. The ‘lake’ turned out to be a man-made reservoir about 25 years old. Where once the poor farmers had to walk up steep dusty paths, the rich can now pull up to their mansion doorstep in their shiny boats. All the exercise and the spectacular view will work up some appetite in you, and you can enjoy a meal at one of the restaurants at the bottom of Piedra del Peñol. 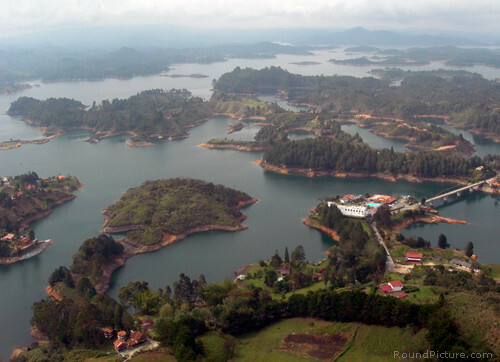 You get to new Guatape by travelling about 45 minutes further along past Piedra del Peñol on the same bus service. But if you happen to miss it, which could happen on a beautiful day by the lake with your belly full of bandeja paisa (a typical dish from the Antioquia region) and cold refreshments, a taxi will get you home for a reasonable fare. it looks beautiful..I’ve never been in Colombia. Hope one day, in the future maybe. I’d definitely call myself a traveller who has seen some of the most beautiful sites planet earth has to offer, and with this in mind I’d say that very few compare to Piedra del Penon…..I just got back from there and I’d recommend it to anyone who loves nature my friends. We are going to Medellín this next week. We will definitely check it out. Thanks for the tip! Un lugar maravilloso. Estuve en Diciembre del 2009 y la pase de maravillas. He estado tres veces en Medellin y ya tengo ganas de regresar. Estoy “amañaito”.